You have all your Halloween Trees decorated, the fall mantle is spectacularly spooky, teal pumpkins are carved, and even your throw pillows tell the world it is Halloween time. Let’s not forget the front door and the all important wreath that greets everyone. 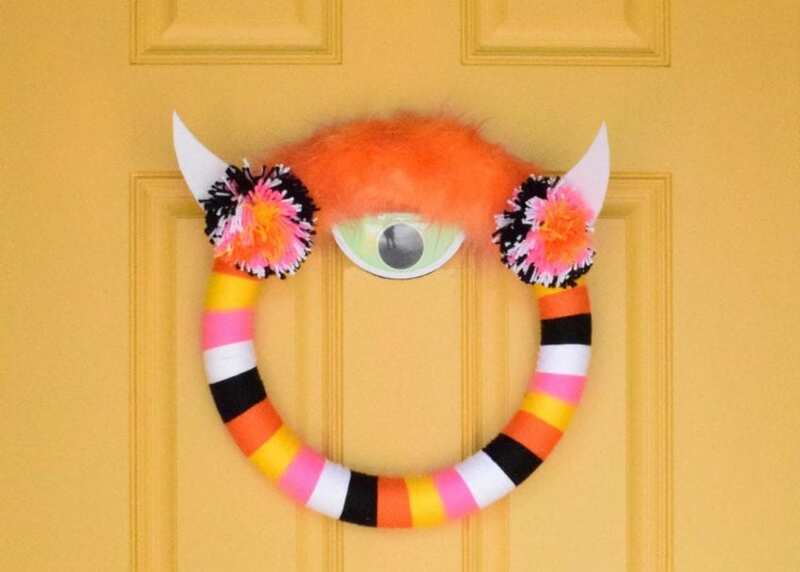 I’ve got 10 funny and cute DIY Halloween wreath ideas to choose from over on DIY Network, but this yarn wrapped monster wreath might very well be my favorite. Posted September 19, 2016 & filed under Halloween, Holidays. Cutest monster ever & the color combination is so eye catching. Thanks for sharing at Merry Monday. I love all of your colorful decorations! They always put a smile on my face and this adorable Halloween wreath is no exception. I’ll be including this in tonight’s MM roundup. Thanks for sharing this craft with us.